In 2008, Rolex introduced a new Submariner in all white gold (with blue dial and bezel), ref. 116619. 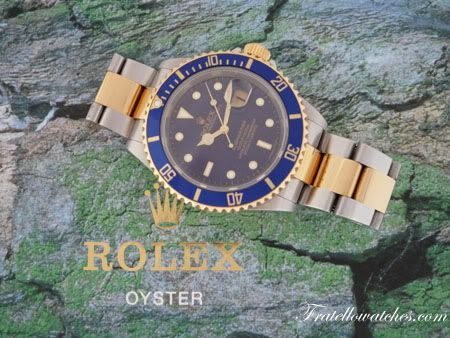 This year, Rolex introduced the gold/steel (Rolesor) model of the Submariner in both black and blue dial versions at BaselWorld 2009. These are respectively the ref. 116613LN and ref.116613LB models (Ariel of aBlogToRead.com did nice coverage on them). When the GMT-Master 116713 and 116710 were introduced a few years ago, I remember a sudden short price drop of its predecessors (ref.16710/16713). Perhaps this is the time to keep an eye on the current/former models of the Rolesor Submariner models (ref.16613). Since a few weeks, I am wearing a Submariner 16613. Once in a while, there is this opportunity to temporarily swap a watch for a while with another watch adept. This time, I swapped my Yacht-Master for this bicolor Submariner with someone from the Dutch Rolex forum. I never received so much comments (both negative and positive) on a wrist watch. Also by non-watch enthusiasts, these so-called ‘evil outsiders’ we all know. 🙂 I also witnessed that several people were staring at this ‘Clown’ watch, as it is being called on the several Rolex forums. Maybe it’s due to the gold, or the blue dial, but this watch looks much bigger than my other Oyster Professional models like the GMT-II 16710 and Yacht-Master 16622. The Sea-Dweller I have looks smaller anyway, because the smaller diameter of its dial. 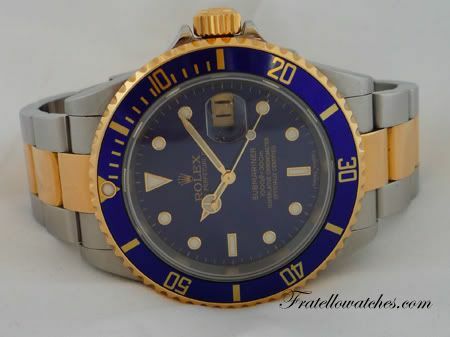 The combination of the blue dial, blue and gold bezel, gold crown and gold center links makes this a real ‘in your face’ Rolex. I discovered that I am more the stainless steel Rolex kind of guy, with a small exception for the platina bezel & dial combo of the Yacht-Master. That’s wild enough for me I guess 🙂 If the dial and bezel color were a bit more toned down, I could probably handle one of these gold/steel (Rolesor) combinations myself. Perhaps a brown dialed Rolex GMT-Master ref.16713 (or vintage 1675/8) would suit me better.